M247 Europe Review 2019: Is M247 Europe a Good Hosting? M247 is a vendor based in the UK and Romania. It uses over 20 data centers all over the world to provide internet connections, hosting, and data security. It has packages for small to large businesses with SSD, free SSL, one-click installer, and a 14-day money-back guarantee. Founded in 2000, M247 is a provider of internet connectivity and infrastructure in Europe. It owns environmentally friendly data centers over the world directly connected to 18 internet exchange points including New York, London, Singapore, Amsterdam, and Bucharest. It’s based in the United Kingdom and Romania, currently operating six offices in those two countries. Its services include internet connections, hosting, and data security. The website is in English and Romanian. The storage is Solid State Drive (SSD). SSD reads and writes data fast and as such serve the data and in turn your website faster. It’s great for website load time and storage life. Another place that the servers perform well is in the port speed. It has a 1Gbit port with guaranteed 1Gbit speed. That means that the server can handle more amount of users downloading more data at the same time. For websites that have a lot of data and traffic, this is an especially useful feature. 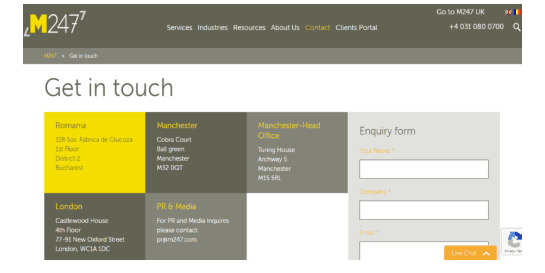 If you sell large digital products and have a lot of traffic, for example, you will benefit from this. Although not directly tied to the web hosting plans, there is customized support for businesses in different sectors, including e-commerce, finance, and software development. With those customized solutions, you get a DDoS network and a customized secure environment along with your web hosting plan. Beginners can use Installatron one-click web application installer in their cPanel, but there’s no website builder. 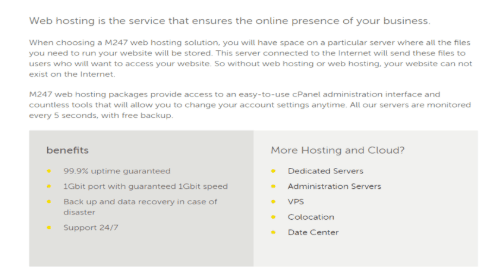 M247 offers web hosting at a low-cost, especially for the resources they provide such as the SSD, high-performance servers, free SSL, and free domain name. Some of the plans come with up to three free domains. Although they don’t offer a free trial, you can request a full refund within 14 days of purchase if you are not satisfied with their service. Customers can contact M247 24/7 support team through live chat, email, and phone. I used the live chat and received an immediate response as expected with live chat. The two team members I connected with provided relevant answers to the issues I raised. If you prefer to solve issues yourself, there is a knowledge base as well. M247 is a good host for server performance and business support. It has a package for every business size. It is one of the few hosting companies with data centers in more than 20 countries, and that’s great for those in need of dedicated servers as you can choose the country you want your server to be. Enjoy speedy performance with M247. Wondering how M247 Europe stacks up against other Web Hosting companies? Enter any other Web Hosting company and we will give you a side-by-side comparison.